Social selling is a very new phenomenon that relies on social media to convert leads. Jill Konrath recently created a video called The Rise of Social Selling, where she pointed out social selling is transforming marketing. “Sellers who’ve embraced social media are creating new opportunities that totally bypass traditional sales channels… It’s about good selling – using all the tools that are available to you today,” Konrath said. It’s extremely effective if it’s done properly, but most people have no idea how it actually works. If you are not happy with the success of your social selling campaigns, you should follow these tips to improve them. Can Social Selling Really Work? Leads generated from social selling were more profitable, since customers made higher ticket initial purchases and were more likely to upgrade at later stages in the sales funnel. As this research indicates, social selling can be extraordinarily effective. However, many brands fail, because they employ old-school outbound marketing tactics. Marketing has historically been a very pushy way to generate sales. Brands often treat their social media profiles like the Yellow Pages. The truth is that old school marketing tactics just don’t work on social media. Once you start to engage with your customers, you should start seeing much better results. Engaging with customers takes effort, but it’s worth it in the long run. Some companies have found social selling to be tremendously effective. IBM was able to increase its sales by 400% with a social selling pilot program. Your business can experience similar results, but you need to invest in your social selling campaign first. Knowing when to post content is one of the most important parts of social media marketing. There are certain times of the day that your visitors are more likely to connect. The nature of your business. Companies in the hospitality industry may find that it’s best to connect with their customers in the evening, since that is when their customers tend to come out. On the other hand, many B2B brands have a better time connecting with their customers during regular business hours. This should be a given. Your customers in Europe and the United States are in totally different time zones, so you will need to schedule your content accordingly. Even if you are engaging with people in the same region, their schedules may differ from competitors targeting different demographics. If you are targeting a younger audience, you may have better luck posting in the evening. 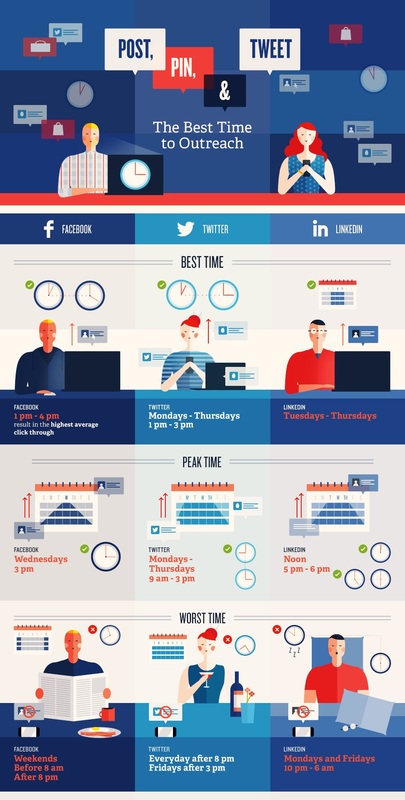 SurePayroll created a great infographic on scheduling social media posts. You can use it as a starting point, but it’s best to run your own A/B testing to determine the ideal time to post content. Creating a social media marketing strategy requires a lot more work than you think. You will need to invest in solutions that help automate the process. There are a number of tools worth looking into, including HooteSuite and Instamacro. If you use automated social media management tools wisely, they can reduce the time you spend on social selling by 60% or more. However, you need to invest in the tools first.